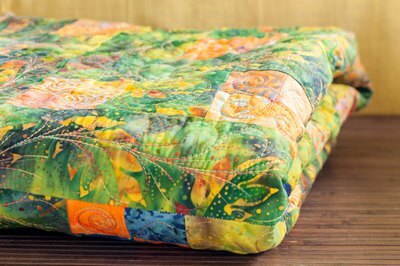 Lap quilts are petite versions of traditional quilts. A lap quilt should be large enough to comfortably cover an adult in a seated position. Quilters make lap quilts in a variety of shapes and sizes, and they can be customized to suit different purposes. The ideal size of a quilt should match the needs of the person who will be using it most. Lap quilts made for someone who enjoys sitting to read or sew should be large enough to keep them warm, but not so large that they are bulky. Lap quilts for someone in a wheelchair need to be large enough for comfort--but need to remain safely out of the way of the wheels. 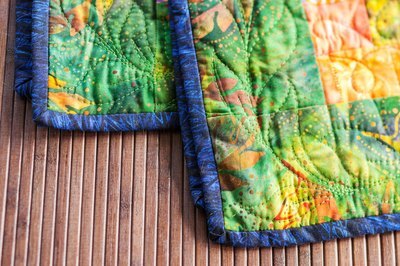 Lap quilts are usually square or rectangular, but they also can be round or even irregular shapes. Shape is often dictated by the proposed end use, and the pattern that the quilt maker wants to use (some patterns work better in rectangles than squares, for example). 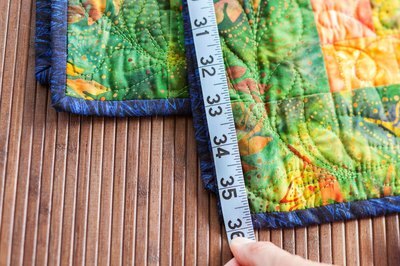 While sizes may vary, most lap quilts measure between 36 inches and 48 inches along each side. A 36-by-48-inch rectangle is a standard lap quilt size, as is a 36-by-36-inch square. Using a good quality cotton or wool batting makes a cuddly, warm quilt without adding too much bulk. Most fabrics for quilting are 44 inches wide. Lap quilts made smaller than 44 inches square don't need to have the backing or batting pieced together to finish the project. 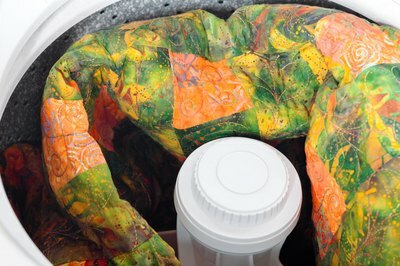 A lap quilt that is under 48 inches square will easily fit into a home washer and dryer. Quilts that are larger than this may need to be commercially cleaned for best results.